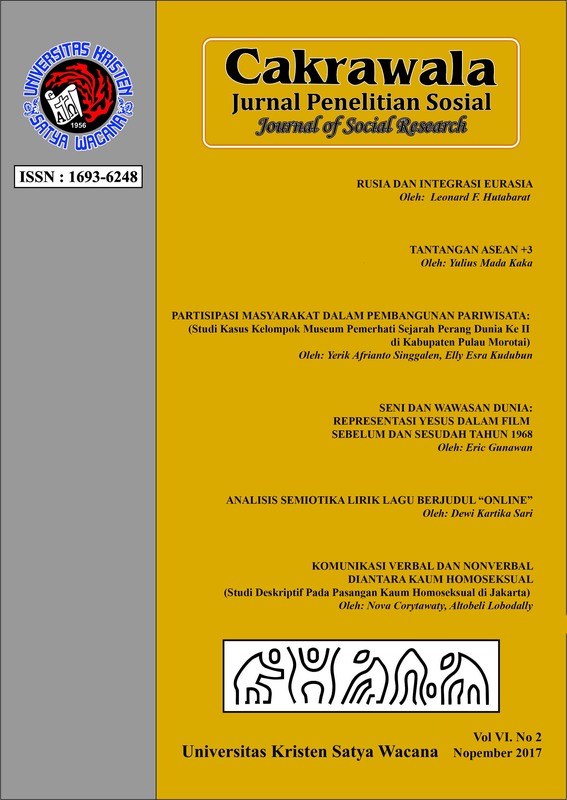 This paper is about to review the lyrics of songs that mark the emergence of information society in Indonesia. The observed song lyrics are the lyrics of a song titled “Online” popularized by Saykoji Artist. The theory used is Saussure's semiotics. The research approach used in this analysis is qualitative approach with descriptive research type. The results of this study indicate that the song titled Online describes the characteristics of the information age society at the time. Deliusno. (2016, June 15). Siapa yang Bilang Yahoo Messenger Bakal Pensiun? KOMPAS.com. Retrieved from https://tekno.kompas.com/read/2016/06/15/12510737/siapa.yang.bilang.yahoo.messenger.bakal.pensiun. Krisianto, ST, A. (2014). Internet untuk Pemula. Elex Media Komputindo. Pence, C. (Ed.). (2012). The Poetics of American Song Lyrics. United States of America: University Press of Mississippi. Sari, D. K. (2015). Perilaku Penggunaan Internet oleh Remaja di Salatiga dalam Perspektif Media System Dependency Theory, 4, 24–50. Straubhaar, J., & LaRose, R. (2002). Media Now : Communications Media in the Information Age (Third Edition). United States of America: Wadsworth Group.